IPL (intense pulsed light) is one of the remarkable forms of skin rejuvenation that can remedy the effects of sun damage, hormones, and skin conditions such as acne and rosacea. There is minimal downtime required. What skin conditions can IPL treat? IPL can help diminish a wide range of skin discolorations and/or abnormalities, such as hyperpigmentation, hypopigmentation, birthmarks, port wine stains, freckles, sun damage, age spots, liver spots, and spider veins. Unlike lasers, which use intense, focused light, IPL rejuvenation® involves intense broadband light. It delivers energy to both the superficial (epidermis) and deep (dermis) layers of the skin while sparing the epidermis from damage. In studies that have been performed so far, IPL has been shown to smooth the skin, and remove age spots, freckles, melasma, and even visible blood vessels. IPL may also improve skin tone, texture and firmness. How is IPL rejuvenation® performed? Depending on the size and condition of the affected area, an IPL treatment can last anywhere between twenty minutes and an hour, but a typical session is approximately 30 minutes. 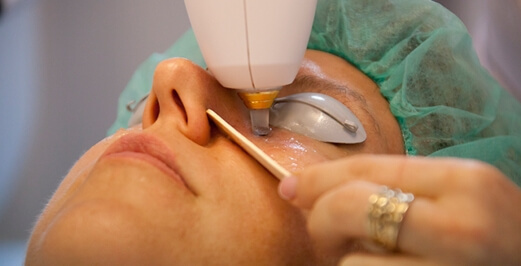 Patients are required to wear protective eyewear during the session. While IPL therapy is minimally uncomfortable, a topical anesthetic can be provided at the discretion of the patient and/or doctor. To begin, a cool soothing gel is applied to the targeted epidermis. Then, the IPL device is activated to deliver pulses of intense light to the targeted area. This high intensity light works to break up the damaged vessels and melanin within the dermis. Some patients can experience mild redness and/or swelling following the procedure, but it is safe to apply makeup and return to work that same day. It is crucial to avoid sun exposure following IPL treatment. 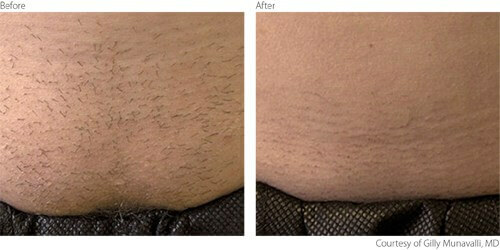 Several treatments are necessary in order to achieve noticeable and desirable results. 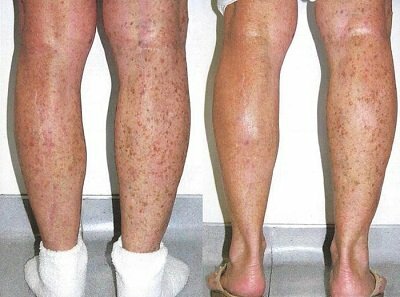 65 y/o Female with extensive sun damage and brown spots on her legs. Did three treatments with Intense Pulsed Light and had significant improvment in the pigment on her legs. Each treatment session was spaced one month apart..
Laser hair removal targets the entire hair structure, from the hair shaft, down to the follicle, meeting the principle of selective photothermolysis. Light energy with a specific wavelength is primarily absorbed by the endogenous chromophore melanin resulting in rapid heating which is required for local thermal necrosis of the follicles’ regenerative structures. To achieve permanent hair removal, the laser system must be able to effectively treat the different hair types and colors as well as the various skin types while providing maximum skin protection. The laser's wavelength, pulse duration and spot size determine the effectiveness of the treatment (on all skin types) and also influence the depth of penetration and treatment speed. The Lumenis' LightSheer® systems (INFINITY™, DESIRE™, and DUET™ ) uses 805nm diode laser technology that has become a well-established method for photoepilation. The LightSheer technology by Lumenis has been validated in numerous clinical studies and peer reviewed articles. Our customers benefit from the LightSheer features and enjoy high patient satisfaction. Submit your email to subcribe for future discounts and events.